Building on the foundation of the well-known BRIC countries — Brazil, Russia, India and China — a new set of up-and-coming emerging markets is gaining attention. 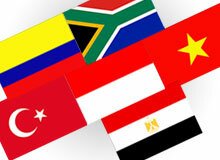 The so-called “CIVETS” countries — Colombia, Indonesia, Vietnam, Egypt, Turkey and South Africa — are now touted as hot markets because they have diverse economies, fast-growing populations, relatively stable political environments and the potential to produce outsized returns in the future. In a recent survey conducted by Knowledge@Wharton and the global communications firm Fleishman-Hillard, a majority of corporate executives, investors and business leaders indicated that they would be interested in doing business with multinationals in the CIVETS countries. Respondents said they were most attracted to CIVETS because of low labor and production costs and the countries’ growing domestic markets. When asked to identify weaknesses, the survey participants cited political instability, corruption, a lack of transparency and infrastructure, and homegrown companies without much of a reputation or brand identification. The Knowledge@Wharton/Fleishman-Hillard survey of 153 corporate and business leaders found a range of enthusiasm for different CIVETS. When asked to say which of the six countries offered a “great deal of opportunity” or “some opportunity,” 86% cited Indonesia, followed by South Africa (84%), Turkey (82%), Vietnam (77%), Egypt (61%) and Colombia (56%). A significant set of respondents (42%) predicted that by 2020, the CIVETS countries would be on a level playing field with the BRICs in the global economy. Wharton management professor Mauro Guillen points to another important difference between the two blocs. Unlike China, Brazil, India and other emerging markets like Mexico, the CIVETS lack established multinational corporations to act as platforms for further economic development, although that could happen in the future. “What makes the BRIC group unique is that not only are they big, but they have their own companies that are destined to be very important outside their own countries,” says Guillen. The EIUacknowledges that the CIVETS do not have the economic power to “reshape the global economic order” as much as the BRICs and their combined GDP will only amount to one-fifth the size of the G7 nations’ combined GDP by 2030. Instead, the CIVETS are second-tier emerging markets that have relatively sophisticated financial systems and do not face runaway inflation, massive current-account deficits or public debt, according to the research firm. Egypt: Although Egypt has a well-educated, prosperous population in its Nile Valley cities, much of the country remains poor and the country has a high level of debt (80% of GDP). The political future beyond the rule of President Hosni Mubarek is cloudy, and the country could face religious turmoil. According to the survey results, respondents agree that the most important factors positioning CIVETS companies to compete in the global economy are: the value of their products and services (75%); GDP growth in their countries (74%); their financial position (53%); innovativeness of products or services (45%); and recognition of their brands outside their home countries (28%). Respondents also characterized the strengths and weaknesses of CIVETS-based multinationals in the global marketplace. The top response (85%) was that these companies need more visibility to get the respect of leading companies in the United States and Europe. That was followed by 67% of participants who agreed that these companies lack appropriate transparency and corporate governance standards to compete internationally; 66% who felt the companies do not have the public policy or public affairs expertise needed to compete; 64% who said the firms do not have the marketing and branding capabilities to succeed in the global marketplace; 52% who felt multinationals in CIVETS nations do not have the communications capabilities to succeed in the global marketplace; and, finally, 51% who felt CIVETS companies are limited in their global thinking. In 2005, Goldman Sachs’ O’Neill came up with a new concept for the next generation of emerging markets — the “Next 11” or “N11,” made up of four CIVETS and seven other countries. O’Neill, who is now chairman of Goldman Sachs Asset Management, notes that Colombia and South Africa were not included in his N11 because their population size restricts their ability to grow into large markets. “Our N11 Group would also include Bangladesh, Pakistan, the Philippines, South Korea, Iran, Nigeria and Mexico, and these 11 would be a more diverse and attractive group,” O’Neill says. The EIU, in turn, narrowed that list down. Nigeria, according to the research firm, is too dependent on commodities. Iran’s politics and international relations are too unstable. The Philippines — dubbed a “perennial underperformer” — also suffers from weak, unstable politics, according to the EIU. Political instability will hold back Thailand as well, and Pakistan’s security problems are acute. Bangladesh, meanwhile, is too poor and vulnerable to the effects of climate change. O’Neill plans to release a paper this month elevating Mexico, South Korea, Indonesia and Turkey, along with the BRICs, to a new status as “Growth Markets.” The EIU left Mexico and South Korea off its list because they were already successful and were “old news” to investors.